Stephen Miller, an angry, obnoxious teen masquerading as an adult man, sat down for an interview with CNN’s Jake Tapper Sunday afternoon. The interview did not go well, to put it mildly, and when Tapper pressed Miller on some of the depictions of the Trump administration in the new Michael Wolff tell-all Fire and Fury: Inside the Trump White House—like, for instance, that staffers believe the President is a giant, stupid infant who is totally unfit for office—Miller was so uncooperative and combative that Tapper shut the whole thing down. Even better: Miller reportedly had to be escorted off the set by security. 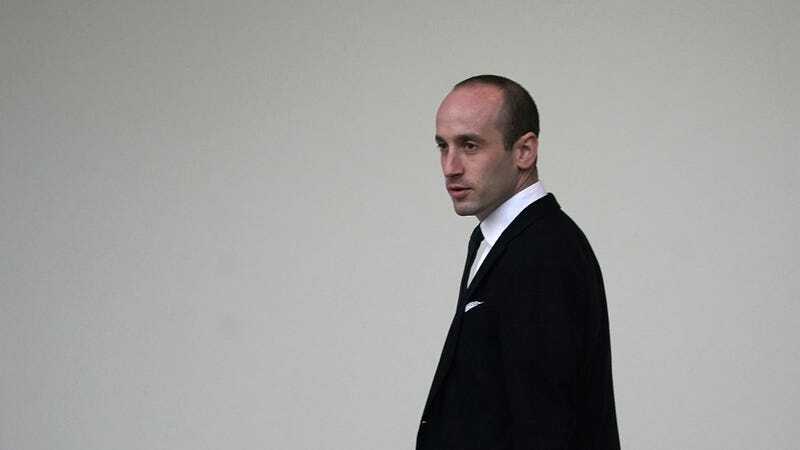 Stephen Miller is the President of the United States’ senior policy advisor, in case you forgot. Tapper cut his State of the Union interview with Miller short after Miller repeatedly praised Trump as a “political genius” and broke into a seemingly unhinged rant about Steve Bannon, CNN, the Russia investigation, and Fire and Fury, which he deemed a “grotesque work of fiction.” Tapper accused Miller of being “obsequious” and “a factotum” who was spinning untruths so as not to anger his boss. “I think I’ve wasted enough of my viewers’ time,” Tapper concluded, abruptly killing the segment. That’s news enough, but Business Insider reports that after Tapper gave Miller the axe, he was “politely” asked to leave the set several times. But no one tells Stephen Miller to turn the volume down on his Burzum CD, and he refused to acquiesce. So, sources told BI, “ultimately security was called and he was escorted out,” hopefully screaming something about what will happen when his father hears about this. It’s cool, though, Daddy’s got his back.